Steve Early moved to Richmond two years ago and is writing a book about the city. He belongs to the Richmond Progressive Alliance. This is not the kind of talk that brightens the day of Chevron managers, either in gritty Richmond or at the corporate headquarters in upscale San Ramon. That’s why Richmond watchers see a big battle brewing over its future as a much-heralded “progressive city.” For seven years, McLaughlin and her allies on the City Council have governed Richmond with a movement-style mix of idealism and activism. 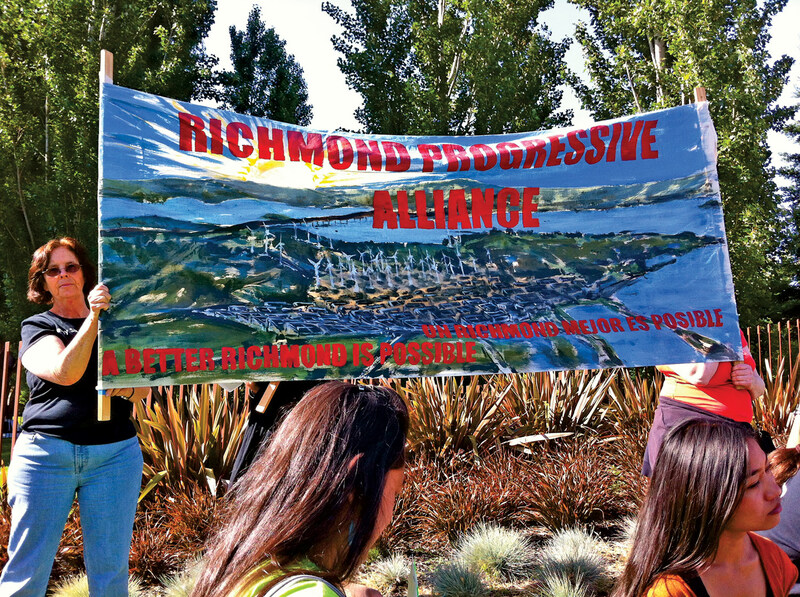 Backed by the Richmond Progressive Alliance (RPA), a coalition of community groups and activists, they have mounted brave challenges to some of the city’s biggest power players, from banks and casinos to Big Oil. Now, as elections loom in the fall, these same powers—led by America’s third-most-profitable company, Chevron—want to make a political comeback by defeating the activists who have curbed their influence. Chevron has long dominated local politics. But it claimed center stage in this year’s election after a big explosion and fire ripped through the Richmond refinery in August 2012. A dozen workers were nearly killed and more than 15,000 East Bay residents sought medical attention. Since then, questions about refinery safety, pollution and Chevron’s role in the community have been key election-year themes, and McLaughlin, Parker and the RPA have been driving much of the conversation. On the first anniversary of the accident last summer, McLaughlin and the City Council spurned a $10 million settlement offer from Chevron; instead, they filed suit seeking greater compensation for the damage suffered locally. A day later, McLaughlin welcomed 2,500 people to a rally in front of the refinery, where speakers like Bill McKibben of 350.org linked the local struggle for refinery safety to the national campaign against global warming. Such unflinching advocacy has been a hallmark of McLaughlin’s tenure. A social activist since the 1980s, McLaughlin, 61, has been elected mayor twice, each time with the help of the RPA. Since its founding in 2003, the RPA has grown from a small core of progressive Latinos, African-Americans, unaffiliated activists and Greens into a combination membership organization, electoral campaign apparatus and year-round facilitator of grassroots organizing. During McLaughlin’s two terms, Richmond has begun to shed its old reputation for gangs, gun violence and drug-related crime. The city of 100,000 is 80 percent nonwhite, with one-fifth of its residents living in poverty. In recent years, it has gained national attention for creative initiatives on behalf of low-income workers, homeowners and victims of industrial pollution. Lately, Richmond has been debating whether to set its own minimum wage. Business lobbying is leading to many exemptions opposed by progressives, but if Richmond’s measure gets final council approval, the city’s minimum hourly wage will rise to $9.60 next year and $12.30 by 2017. Not every reform has panned out. a proposed penny-per-ounce levy on sugary drinks to fund public health and recreation programs was rejected by voters in 2012, after the beverage industry spent $2.5 million demonizing the idea. The defeat of two RPA City Council candidates that same year, legal challenges to business tax increases and federal pre-emption—which prevents initiatives like the better regulation of hazardous crude oil shipments through Richmond by rail—have all narrowed the scope of what can be accomplished locally. Even Richmond’s much-publicized anti-foreclosure program has run aground temporarily. Big banks and local real estate interests launched a multi-pronged scare campaign about its feasibility, impact on property values and consequences for the city’s bond rating. Hundreds of residents mobilized to keep the initiative on track last fall, but only four of the seven City Council members voted for the plan—one short of the five-vote “supermajority” needed to implement it. With so much work still to be done, the RPA is determined to maintain its city hall role and has pulled together a slate of candidates that includes not only McLaughlin but her equally outspoken vice mayor, Jovanka Beckles, and Eduardo Martinez, a retired schoolteacher. And, of course, it has tapped Parker to run for mayor. A key RPA organizer who spent thirty-two years as an autoworker and skilled tradesman in Detroit, Parker now works as a community college instructor in industrial electronics. As mayor, he hopes to expand opportunities for similar job training so that more of Richmond’s young people will qualify for better-paying jobs. But getting elected will not be easy. Arrayed against Parker are two well-known Democrats, both members of the city’s African-American community and much better financed. (Parker is white.) One is Nat Bates, 82, a retired probation officer and the City Council’s longest-serving member. As a foe of the soda tax and reliable friend of Chevron, Bates and two council candidates aligned with him benefited from hefty corporate largesse in 2012, including $1.2 million worth of independent expenditures from Big Oil and $2.5 million from Big Soda. When he ran unsuccessfully for mayor against McLaughlin in 2010, the police and firefighters’ unions spent heavily on ads claiming that she had overdue student loan payments and had been treated for depression. Even with the RPA’s many business adversaries sinking money into the election, RPA candidates have been alone in refusing corporate cash. This not only sets them apart from other candidates but also leaves them at a distinct funding disadvantage, despite Richmond’s modest system of public financing. (Candidates can get matching funds up to a $25,000 limit.) Banking and real estate interests are expected to weigh in heavily, eager for payback. “I think the eminent domain program will dog the candidates who backed it,” predicts Jeffrey Wright, past president of the local realtors association. To counter the expected “air war” against its candidates, the RPA plans to do more door-to-door canvassing this year than it ever has before—particularly among Latinos, a growing RPA constituency. The RPA slate has also picked up endorsements and some donations from Bay Area unions, including those that represent municipal workers, rapid transit employees and healthcare personnel at Kaiser Permanente. If the mayor’s office is lost, Richmond will still have a community-minded police chief; a highly effective city manager, Bill Lindsay; and some liberal or progressive voices on the City Council. But its current innovative direction would certainly change under Ramsey or Bates. The bully pulpit used by McLaughlin to promote a variety of different causes would become a platform, once again, for an older-style municipal leader more eager to please the powers that be. And Chevron will be back pulling the strings, just as it did in Richmond’s earlier existence as a well-oiled company town.